This is one of my favourite plants. I have been growing it for about 20 years and it has a few flowers most of the year with a main flush in spring and autumn. It is a low spreading plant. I have another form which is quite flat. 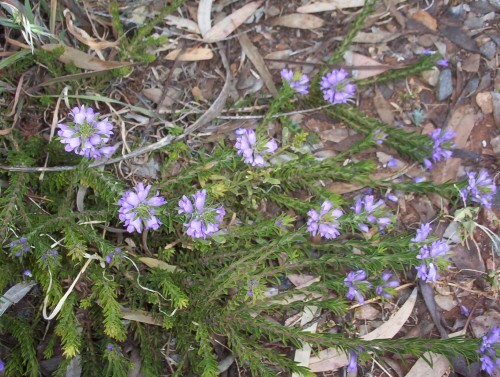 Not a vigorous plant to be controlled but grows to about a metre (3 feet) wide in our poor soil. The one in the photo occasionally has branches to about 30cm (1 foot). I have not seen any frost burn on the tips but occasionally caterpillars make webs in some branchlets and defoliate them. The colour is a deep purply blue and I have seen variations on this on other plants. It is a difficult colour to photograph.